For people in parts of Arnhem district. Issued at 10:50 am Sunday, 7 April 2019. HEAVY RAINFALL EXPECTED OVER EASTERN ARNHEM DISTRICT. Weather Situation: The monsoon trough is currently located near the northern Arnhem coast. 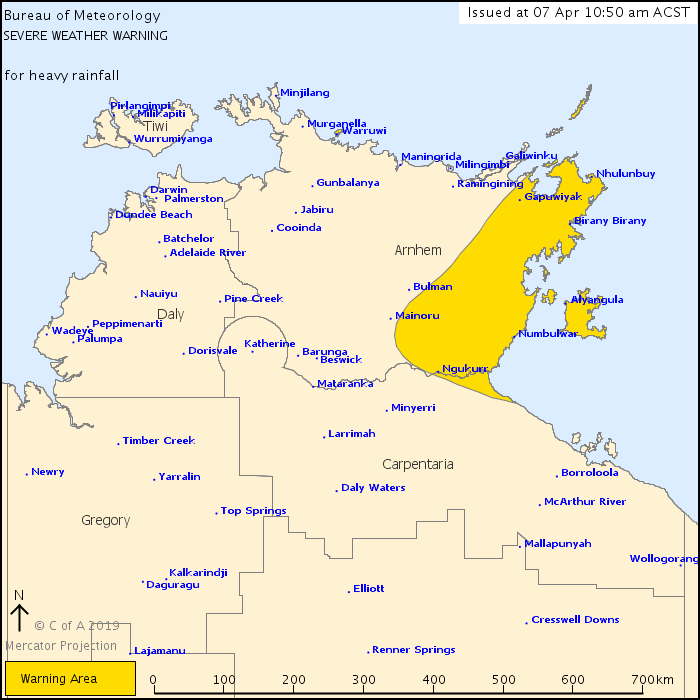 A weak tropical low is located within the monsoon trough close to Maningrida, near 12.0S 133.0E, at 0930 ACST. The Tropical low is enhancing moist deep easterly flow and convergence over the eastern Top End, leading to possible heavy falls in the area. Current radar and satellite imagery at 1030 ACST shows an area of widespread moderate rain over northeastern Top End with isolated heavier rain and showers. HEAVY RAIN, which may lead to FLASH FLOODING, is possible over the Arnhem District today and into tomorrow. 24 hour rainfall totals of 50 to 100 mm are expected, with isolated falls of up to 150 mm possible. Locations which may be affected include Nhulunbuy, Alyangula, Ngukurr, Warruwi, Gapuwiyak and Numbulwar. Damaging wind gusts are no longer expected with this system. Gove Airport received 120.8mm in the 24 hours til 0900 ACST Saturday morning.